Greetings, friend. From the fresh wax on your mustache, I gather you’ve just left the barber’s. Well, have a seat and let The Only Dietsch mix you up a cup or two. I have a couple of sips you might like. Now, I think you might have had this first one before. Yes, I think you just might. The bar was a bit busy that night, and so I’m not sure you got to watch the master in action. This is a drink, my friend, that calls for a touch of finesse. What? That’s an unkind thing to say, sir, mighty unkind. I don’t have to remind you where the door is, now, do I sir? No, no, I am merely jesting with you, sir, merely jesting. I would never turn away your custom, sir. Now, as I was saying. This drink requires a light touch to achieve the layering effect that marks this drink as one of refinement. No, no, I know what you’re thinking. This isn’t a sweet drink like a Pousse Cafe! Not at all. Leave those to that dilettante Ellestad! You’ll have none of those in my bar! All right, all right. To the drink, then, to the drink. Yes, sir, I agree that it’s a fine drink. 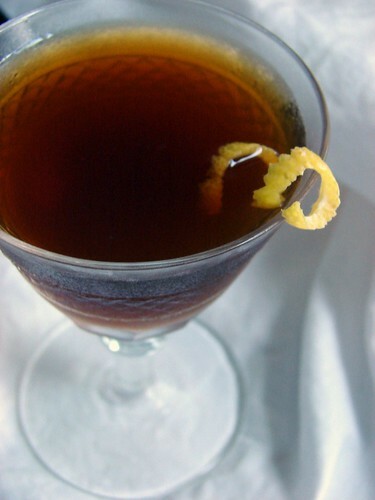 When you sip it slowly, the port gently seeps up through the gin and gently enriches the genever. Why, sir, if this drink is not still served in the bars and taverns of the twenty-first century, I should be mightily sad. But now, remember, young lad. When you’re adding the port, be careful. Take it slow. If you don’t, the port will co-mingle with the gin, and although the drink will still taste just fine, it will not be as elegant. We are gentlemen, sir, always remember. We do not simply guzzle the way the hoopleheads do. Now, as to the next, this upstart William Schmidt, I do swear he stole this drink from me. I was mixing this back when he was still tramping around Paducah, Kentucky, waiting to stow away on an Ohio River steamer to Memphis. The man is a scalawag, and not at all a gentleman like you and me, sir. But let us not consider his sort. I believe you will like this one, sir. 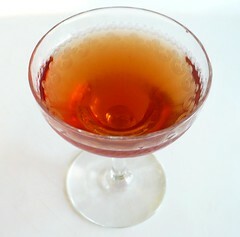 I think you will find that the sherry and vermouth balance quite toothsomely. The other ingredients round out the flavor without bringing themselves to the fore. I’m throwing off this pretense entirely right now, so I can talk about this drink. I used, for two drinks, a generous squirt of simple syrup for the gum. Yah, a squirt. Don’t tell me you always precisely measure your simple syrup, dangit. Angostura might be the closest thing to a nineteenth-century bitters that I have, although I don’t know how to categorize Fee’s Old Fashioned or Bitter Truth’s Old Time Aromatic Bitters. Regardless, I used Angostura, about two to three dashes worth for two drinks. Also, two or three dashes worth of Lucid absinthe. I’ve transferred my remaining Lucid to a old Fee’s bottle for dashing purposes. For two drinks, I used 4 oz. Italian vermouth and 2 oz. oloroso sherry–to retain the 2:1 ratio. I don’t really know what vino vermouth is, but Paul Clarke suggests that it’s Italian vermouth, and that’s good enough for me. He uses Carpano Antica for this type of drink, but I’ve yet to find a source for that in Rhode Island. I’ll probably have to special-order it from our friends at Eno. Finally, this is a damn good drink. Light in alcohol but rich in flavor. I think the Antica would bring a bit more complexity than the Cinzano I’m currently using, but even so, we loved the balance of flavors. Oh, and back to the Princeton? I’d love to see that on a drinks menu somewhere. It’s a beautifully balanced drink, and it looks just lovely in the glass. Yeah, it takes a bit of work to get it just so, but no more than a properly prepared Sazerac or Pisco Sour. Many thanks to Dinah for hosting. Photography by Jennifer Hess; all rights reserved. For my part, this became another MxMo post from the Department of Fall-Back-and-Punt. I just finished mixographer David Wondrich’s book, Imbibe!, and I found a great drink idea in there–one that combines ingredients I’ve never mixed before. I was excited to try it, but I was missing a key ingredient, Plymouth gin….My instinct told me that my gin on hand, Tanqueray, probably wouldn’t work well in the cocktail I had in mind, so I came home to consult my cocktail books and find a Plan B. My Plan A for MxMo was the Princeton cocktail, from page 262 of M. Wondrich’s fine book–the unfamiliar mix being gin and port.